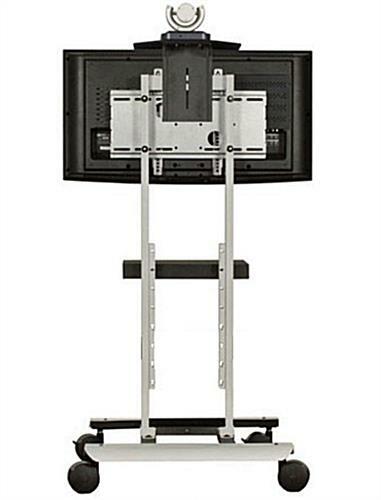 These Monitor Stands Will Accommodate LCD TVs of Different Sizes! These Plasma Screen Displays Are Flat Panel Racks with a Tray for a Video Conference! These Monitor Stands Are Ready to Ship! Durable steel fabrication will last a long time. Camera shelving moves up and down to match the sightlines of the conference audience. Six plug surge protector allows users to power different electronics. 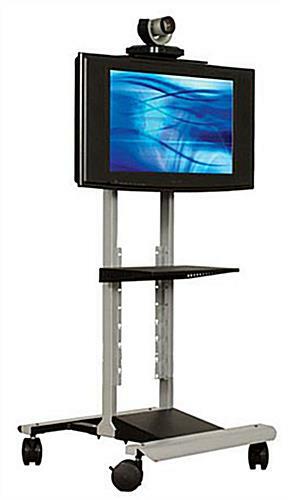 These monitor stands, sometimes called plasma screen holders, include a camera shelf for conducting a video conference. The flat panel racks are made out of sturdy steel to resist damage and chipping. These monitor stands with the silver and black finish include the four wheels, two of which lock, for easy moving from one area to the next. The plasma screen holders come with a six outlet power strip to power the various accessories. 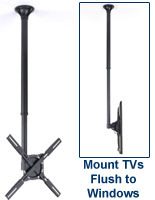 These wheeled monitor stands are designed to hold 20" through 42" televisions from major manufacturers. 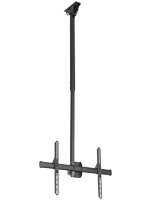 The flat panel racks all have VESA compliant mounting patterns for installing most screens within the dimensions. 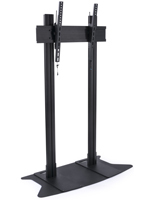 These monitor stands allow users to adjust the camera shelf to suit the conference goers. The flat panel displays are great choices for businesses on a budget. 18.0" x 61.0" x 21.0"